Dieudonne, a Paris comedian with a small but faithful following, is being investigated for an alleged anti-Semitic slur during a recent show directed at a journalist for France-Inter radio. Interior Minister Manuel Valls said last week he's seeking to ban Dieudonne's performances as a risk to public order. Dieudonne has been convicted of inciting racism more than a half-dozen times, most recently last fall for a song using a play on words making light of the Holocaust. Dieudonne denies that is the case but he lost an appeal in November. He is increasingly known for a hand gesture picked up by fans and celebrities described by detractors as an "inverted Nazi salute." Most recently, soccer player Nicolas Anelka used the sign – one hand down, the other placed on the opposite shoulder – to celebrate a goal in a Premier League match. 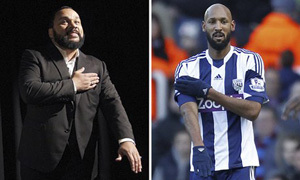 Both Anelka and Dieudonne claim the salute is anti-establishment and not anti-Semitic. The comedian embarks on a tour of France this month, and some cities have said they don't want him in town. The mayor of the eastern city of Nancy, Andre Rossinot, issued a statement Thursday saying that when free expression "transforms into racist, xenophobic and anti-Semitic propaganda there is reason to react." In a statement released by the San Antonio Spurs, basketball star Tony Parker apologized last week for making the gesture three years ago, saying he "thought it was part of a comedy act." The Paris prosecutor's office said Thursday it is investigating threats against a comedian the French interior minister wants banned from the stage for what he says are racist and anti-Semitic performances. Dieudonne M'Bala M'Bala, who performs as Dieudonne, claimed he received four phone calls Tuesday threatening him and the Theatre de la Main d'Or, where he often appears, prosecutors said.